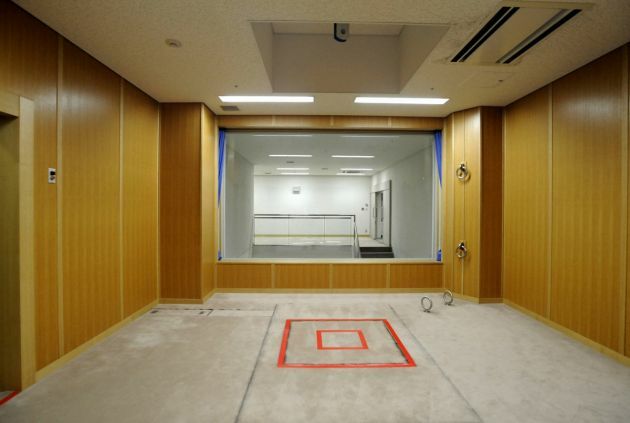 (Photo: Reuters/Kyodo)An execution chamber is pictured at the Tokyo Detention Center on Aug. 27, 2010. Japan opened up its gallows for the first time to domestic media, a move that sparked public debate over executions in a country where a hefty majority supports retaining the death penalty. Japanese authorities have defied international pressure in executing three prisoners on death row, the first since Prime Minister Shinzo Abe was elected in December. The justice ministry in Tokyo said the executions took place separately, in three different locations, early on Thursday and were the first since September 2012. "I ordered the executions after giving them careful consideration," justice minister Sadakazu Tanigaki told reporters. "These were extremely cruel cases in which the victims had their precious lives taken away for very selfish reasons." In December 2012, 111 States voted for suspension of the death penalty at the United Nations General Assembly in New York, an increase of two from the last vote in 2010. U.N. voting over a number of years indicates slow but steady opposition to killing prisoners as punishment. In 2012 there were 41 votes against suspending the death penalty, with 34 abstentions. "The executions are the first since the administration took office in December and raises fears that the pace of executions may increase during prime minister Abe's term," said Amnesty International. Along with the Roman Catholic Church and many Christian institutions, Amnesty strongly opposes sentencing people to death. Masahiro Kanagawa, 29, was hanged at Tokyo Detention Centre on Thursday, along with Kaoru Kobayashi, 44, at Osaka Detention Centre and Keiki Kano, 62, at Nagoya Detention Centre. Kobayashi and Kano were executed despite both being in the process of preparing to apply for retrials. "These executions, carried out under a shroud of secrecy, are a callous act of premeditated killing," said, Roseann Rife, Head of East Asia at Amnesty International. Japan's justice ministry said one of the condemned men, Kobayashi, had received the death sentence for the abduction, sexual assault and murder of a seven-year-old schoolgirl in 2004. He sent a photograph of the murdered girl to her mother. The three murderers, all men, were hanged early in the morning following several years on death row. Justice minister Tanigaki said the execution order was carried out "after carefully considering" each case. Amnesty pointed out that the number of death row inmates, at 134, is at one of the highest levels in Japan in more than half a century. "Prisoners are typically given a few hours' notice before execution, but some may be given no warning at all. Their families are typically notified about the execution only after it has taken place," noted Amnesty. The latest executions are the first under a new politically conservative government led by the Liberal Democratic Party, sworn in in December. In recent years, Japan showed signs of looking to suspend the death penalty. In 2011 it carried out no executions. But they restarted in 2012. The previous government, led by the left-of center Democratic Party of Japan, executed nine people during just more than three years in office. That included 18 months from July 2010 in which no hangings took place. In the three years to 2008 there were 28 executions under LDP administrations. The DPJ raised hopes among abolitionists in 2010 when it established a panel to look into Japan's use of capital punishment but in January 2012, the body was disbanded without reaching a conclusion. Japan and the United States are the only major industrialised countries to retain the death penalty. In Russia the death penalty has been suspended, although it is legally allowed. In a recent open letter, campaigners called on Tanigaki to "immediately introduce a moratorium on executions and initiate a national public debate aimed at promoting full abolition of the death penalty in Japan." The death penalty has been shown in polls to have strong public support in Japan as it does in some countries where executions have been abolished, such as in South Africa. Amnesty International says it opposes the death penalty in all cases without exception regardless of the nature of the crime, the characteristics of the offender or the method used by the state to carry out the execution. "The death penalty violates the right to life and is the ultimate cruel, inhuman and degrading punishment," it says. The Catholic Church under Pope John Paul II, who died in 2005 declared its almost total opposition to the death penalty saying exceptions justifying it are "very rare, if not practically non-existent." The Catechism of the Catholic Church states: "If bloodless means are sufficient to defend human lives against an aggressor and to protect public order and the safety of persons, public authority must limit itself to such means, because they better correspond to the concrete conditions of the common good and are more in conformity to the dignity of the human person." During a legislative hearing in the U.S. state of Maryland, Archbishop William E. Lori of Baltimore on Feb. 5 supported efforts to end the death penalty in the state, calling for punishments that respect human life. "While those who have done terrible harm to others deserve punishment," noted Lori, "we urge a response that meets evil with a justice worthy of our best nature as human beings, enlightened by faith in the possibility of redemption and forgiveness." Catholic opposition to the death penalty is founded upon the idea that "every human life is sacred and to be protected," the archbishop stated. He stressed the protection of life and the human person "from the moment of natural conception until natural death." In 2011, 13 U.S. states executed 43 inmates while in 2010, 46 people were executed. In 2012, nine states executed 43 inmates. An editorial in The New York Times on Jan. 1 said, "The large number of states no longer carrying out executions indicates a kind of national consensus. It points to 'the evolving standards of decency that mark the progress of a maturing society,' an idea that the Supreme Court has evoked in judging the constitutionality of punishments. "The court used that analysis most recently when it ruled that mandatory life sentences without possibility of parole are unconstitutional for juvenile offenders even if they are convicted of homicide. "It should similarly recognize that under evolving standards capital punishment is cruel and unusual and should be abolished."